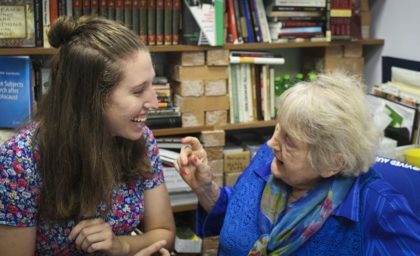 Since the age of 11, Casey Bush ’19 has been dedicated to learning as much as she can about the Holocaust. It may come as no surprise, then, that Bush chose to major in history, with a concentration in Holocaust and genocide studies. 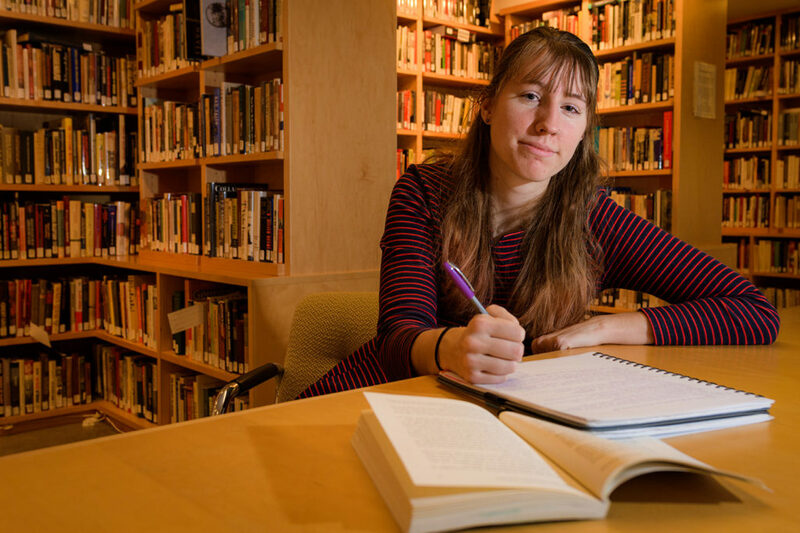 At Clark, she has taken every opportunity to study the Holocaust, from extracurriculars to study abroad opportunities. Since her first year, Bush has been heavily involved in STAND (The Student-Led Movement to End Mass Atrocities). She now serves as student director, managing a team of 12 students, three task forces, and hundreds of grassroots organizers who advocate for government policies to prevent genocide and mass atrocities. The fall of her junior year, Bush studied abroad at Charles University in Prague, Czech Republic, where she took a seminar class that traveled to various Holocaust sites and memorials, including Auschwitz-Birkenau in Germany, and Terezín and Lidice in the Czech Republic. She also interned at the Institute for the Study of Totalitarian Regimes in Prague, where she researched Holocaust education in Czech schools and created materials that teachers could use in their classrooms. As a result of her study abroad experience, Bush worked closely with Thomas Kühne, director of Clark’s Strassler Center for Holocaust and Genocide Studies, to research her honors thesis on the topic of forgiveness after the Holocaust. In the summers of 2017 and 2018, she worked alongside Eva Mozes Kor, founder of CANDLES (Children of Auschwitz Nazi Deadly Lab Experiments Survivors) in Indiana. Kor is a survivor of Nazi doctor Josef Mengele’s medical experiments with twins at Auschwitz. Last summer, Bush began further researching Kor’s story, and then interned and conducted research at Buchenwald Memorial, the concentration camp in Weimar, Germany. Below, we asked Bush about her research, her internships, and what she plans to do after Clark. Tell us more about your research with Eva Kor and CANDLES. With support from Clark’s Steinbrecher Fellowship, I was able to travel to Terre Haute, Indiana, to meet with Eva Mozes Kor and the CANDLES staff to research the CANDLES archives and interview Eva for my honors thesis. Eva has a fascinating life story, which includes her 1995 decision to forgive all Nazis, despite the fact that most of her family was murdered by their cruel acts. As my thesis focuses on forgiveness after the Holocaust, I found Eva to be a perfect case study. I wanted to find out why she forgave when almost no one else did. Additionally, after digging through the documents and letters she has been saving for the past 50 years, I wanted to study the response that Eva’s decision elicited. Describe your internship at Buchenwald Memorial. I spent three months in the pedagogical department creating materials for English-speaking schools to use when planning a trip to Buchenwald. I also assisted with a two-week international summer camp at the Memorial, and took part in a cross-cultural dialogue about the way the Holocaust is taught in schools in Europe versus America. Have you discovered anything illuminating in your research? How does your research on the Holocaust connect with your post-graduation plans? Both my research on forgiveness after the Holocaust and my internship at Buchenwald have provided me with the skills necessary to pursue my dream of teaching others about the Holocaust — perhaps in a museum or memorial similar to Buchenwald. In addition, my research is furthering my skills as a historian and improving my knowledge of the topic, and my internship allowed me to better understand the ins and outs of working at a memorial site.